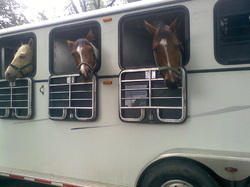 Shippers that have been contracted by clients who transported horses. Let them know that you found them through Voice For Horses Rescue Network, Inc.
Yahoo Shipping forums - you must join the forum to post. So you live in Europe, Ireland, England, Amsterdam and want to save an American horse, here is some info that was put together for me by one of our horsehelpers Colleen. Thank you Colleen! The export company used by another facebooker to get her horse to England is at www/ez2spotranch.com . The whole process, pick up was at Ohio, transport to Texas for quarantine, all vet checks before export and after arrival are included in the fee of approximate US dollars of $5300 or English pounds of 4000. 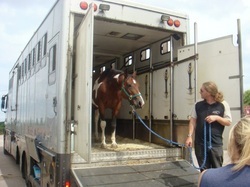 They arrive at the airport after their quarantine period and are flown in secure crates and with groomers traveling with them, arrive in Amsterdam, uncrated and given a day of rest, then onto Ireland or England. Our facebooker highly recommends Diana and Terry with this company. The only other cost is that within 30 days of arrival in England there is an English tax of 6% for registered horses or 11% for unregistered horses. That tax is based on the horses cost (adoption fee or whatever else the new owners out of pocket costs were).